GSSN was founded many years ago and is a non-profit organization in southern Nevada. Membership is over 350 and continues to grow and it’s members come from all walks of life. The club has monthly meeting’s and outing to their private gold claim’s. The club has prospecting equipment available for check out to its members. Some members prefer metal detecting while others use gold extraction equipment such as dry washers and recirculating sluices, you find the Gold – you keep the Gold! The club has five claims and you can go out anytime on your own to prospect. 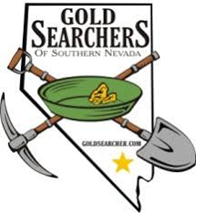 Nevada gold prospecting, Las Vegas Gold, Gold prospecting equipment, Prospecting gold, Gold panning in Nevada, Prospecting Equipment, Gold Panning, Nuggets, Gold mining, Gold pans, Gold panning equipment, Tours, Camping, Where can I find gold, Nevada gold, Arizona gold, Gold prospecting supplies, Gold prospecting equipment for sale, Arizona gold panning, Recreational gold panning, Prospecting Dealers, Supplies, Gold Rush, Dry Washers, Sluice, Classifiers, Metal Detectors, Keene, Highbankers, Detectors, Garrett, Minelab, Whites, Books, Desert, Jobe, Jakes Mining Equipment, Prospecting Supply Store, Gold Store, Las Vegas Mining Dealers, Arizona gold.